Thank you, Chuck Taggart, for giving me so many excellent ideas! 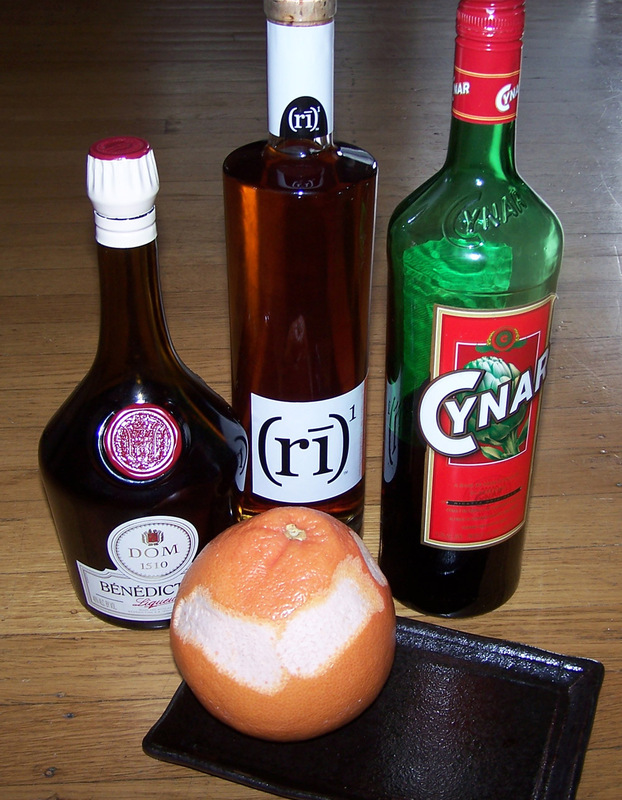 I am a sucker for Cynar, and a huge fan of rye and Benedictine, so this recipe drew me like a moth to a flame. It’s not the most daring or unusual drink, but if you like them brown, bitter, and stirred, then this is a drink for you. 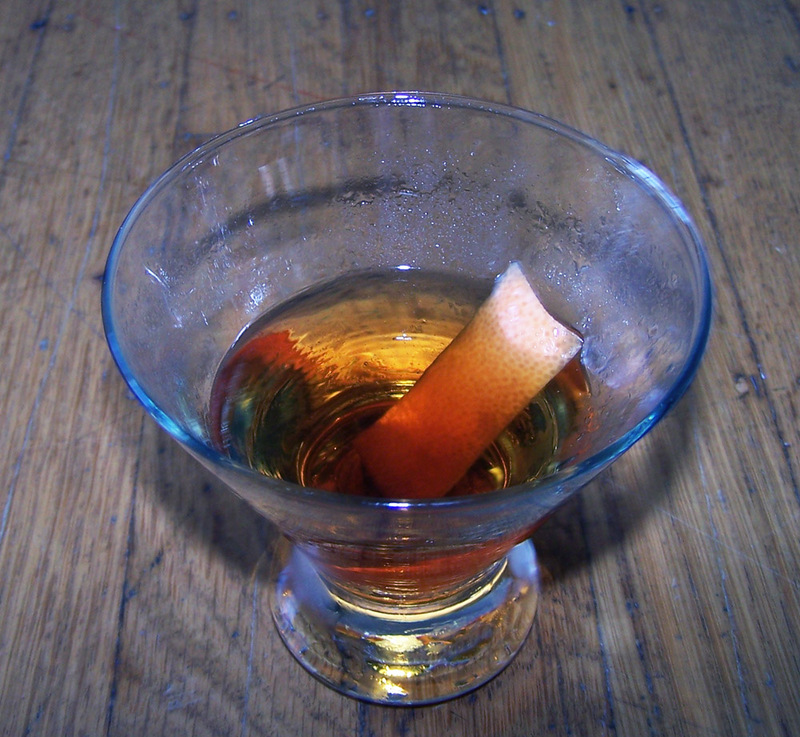 To express the oil in a piece of citrus peel, simply squeeze it over the surface of the drink. A mist of citrus oil will spray out and float on top, providing a crisp, aromatic experience for both the imbiber and the bartender. I’m not sure if I’ve ever had a drink with grapefruit oil before, and I found it to be a rewarding experience. The bitterness from the grapefruit made an intriguing contrast with the bitterness from the Cynar, because one is vegetal and the other is fruity. The Arts District was a welcome study in bitter flavors, although the the rye whiskey was overshadowed by the strong herbal qualities of the liqueurs. That might have been my fault for using RI1, which is delicate for a rye. Even with that minor complaint, the drink is well put-together, with an excellent balance between the Cynar and the Benedictine, and a pleasing sweetness that spans the flavor ‘spectrum’. Categories: modern drinks | Tags: benedictine, bitters, cocktail, cocktails, cynar, drinks, grapefruit, grapefruit oil, grapefruit peel, rye, whiskey | Permalink. I like to think of myself as an idea man (whether it’s true or not). Try that one again with Rittenhouse bonded. And if you really like Cynar, look in my index for Growing Old and Dying Happy is a Hope, Not an Inevitability (you’ll need the Rittenhouse for that too). Cheers! Unfortunately, I have had some trouble locating Rittenhouse bonded Rye up here in Seattle, though it’s been on my list of “things to buy” for quite a while. In the mean time, do you think Old Overholt would be alright? Overholt is lower proof and a little less on the spiciness scale. I’d suggest maybe Wild Turkey 101 rye first.